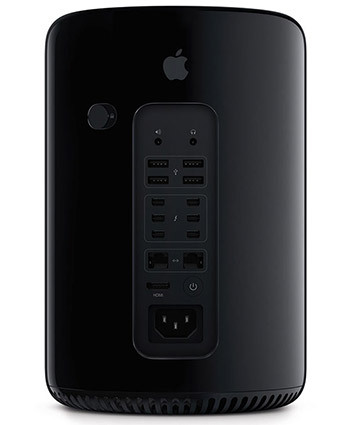 No one will confuse the Late 2013 "Dustbin" Mac Pro for previous models. With it's much smaller "Mr Fusion" profile the only internal expansion allowed comes from the 4 easily accessed memory slots. Processor upgrades are also possible but only for the brave. These machines are designed for "external" expansion via their vast array of high speed ports. Display support for these workstation level machines allows for 1 UltraHD HDMI display or up to 6 Thunderbolt displays or up to a pair of 4k displays. This model Mac Pro Six Core 3.5GHz (Late 2013) gets it's power from a single 3.5GHz Six Core 22-nm Xeon E5 1650v2 processor with 256k of dedicated level 2 cache per core and 12MB of level 3 "Smart-Cache". The base factory configuration for this model is 12GB DDR3-1866 (PC3-14900) ECC SDRAM (three 4GB DIMMs, officially expandable to 64GB but currently supports 128GB), one 256GB PCIe SSD drive plus a pair of AMD D300 FirePro graphics cards, each running 2GB of GDDR5 RAM. Ports and connectivity come via 6 high speed Thunderbolt 2 ports, 1 UltraHD HDMI 1.4 port, 4 USB 3.0 ports, a pair of Gigabit ethernets plus 802.11ac and Bluetooth 4.0.